Are these comments applicable internationally? Undernutrition – protein energy malnutrition or specific nutrient deficiencies – has been an inherent characteristic of impoverished populations throughout the world. Over-nutrition, obesity and nutrition imbalance is a current concern among those with rising though still insufficient incomes. We review data to suggest that the prevalence of these forms of malnutrition in populations is highly influenced by the rate of appearance of discretionary income. In developed countries, discretionary (alternatively "disposable") income refers to funds available after obligate payments (rent, heat, and the cost of getting to work) and payment for necessities (food and clothing). For families living at or below poverty, the last dollar earned is spent on these obligations. Undernutrition is common. By contrast, likelihood for obesity or imbalance increases with rising income when that last dollar is earned without certainty that it is available for discretionary spending. In the United States, neither under- nor over-nutrition is likely when new income is free and clear of debt or obligation. This occurs at approximately three times the poverty level. While income poverty and food insecurity affect risk for malnutrition rather than outcome, nutrition education programs that address issues of income and food support increase likelihood for adherence to recommendations. We suggest that in the United States and other developed countries, a lack of discretionary income affects food choices and ultimately nutritional status. Untoward outcomes include undernutrition – growth retardation or specific nutrient deficiencies, and overnutrition – primarily obesity. The specific economic influence on nutritional status is the appearance of discretionary income. Neither under- nor overnutrition are common when new income is free and clear of debt or obligation – past three times the poverty level. The prevalence of these forms of malnutrition in the United States and other developed societies is highly influenced by both the level of income and support and the availability of discretionary income. The essential question is "How will the last dollar earned be spent?" Discretionary (alternatively "disposable") income refers to funds available after obtaining necessities. These costs include food, housing, health care and the expenses of maintaining employment – day care, clothes and transportation. The interaction between definitions of poverty and sources of income and resources is fully described by Citro and Michael. (Figure 1). Engel Curves. Poorer workers' increased earnings do not generate discretionary income until the total of income from earnings plus supplementation reaches poverty level. Past poverty level discretionary income appears until, at about three times poverty level income, all new money earned is available for discretionary spending. – not necessarily food, housing or other essential needs. (This figure is reproduced from Malnourished Children in the United States with permission). 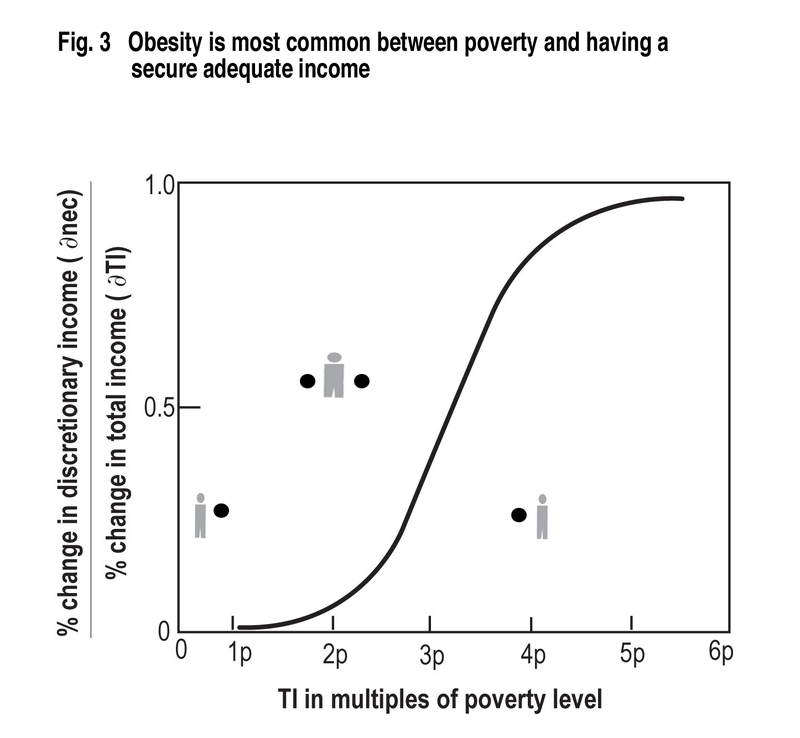 There is a curvilinear relationship between poverty and childhood obesity. 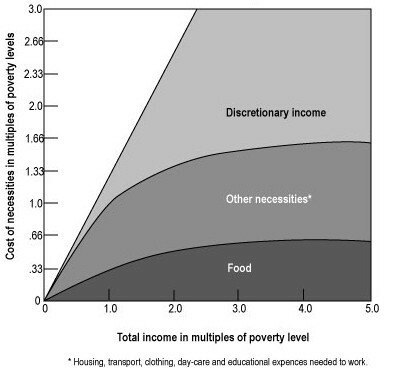 [24, 27] At poverty level or below, all income goes for necessities. Increasing the total income has no effect on discretionary income since none accumulates. Children in families with incomes below the poverty are most 'at risk' for undernutrition – either growth retardation or specific nutrient deficiency. From 1 to 3 times poverty level incomes, discretionary income appears until, at three times the poverty level, all new income is discretionary. As the data provided by Hofferth and Curtin suggest, children who live in families with incomes at the margin of poverty and sufficiency are at increased risk for obesity. These data reinforce similar observations by Garn in his evaluation of data from the Pre School and Ten State Nutrition Surveys of 1968–70. Leanness was found among the poorest and most affluent while adults living in mid-level income families were more likely to be obese. The ratio of change in food expenditures to change in income is called the marginal propensity to spend on food. (5) In developing countries, the marginal propensity to spend on food is high for the poor and low for the affluent. Similarly, in the United States, the last dollar earned by a poor family will represent obligate spending with some part going for food. For the affluent, expenditures for food change little with increased or decreased income. Rather, increased income provides an opportunity for choice as new income is available entirely for discretionary spending. This "income of opportunity" is not available to the poor. 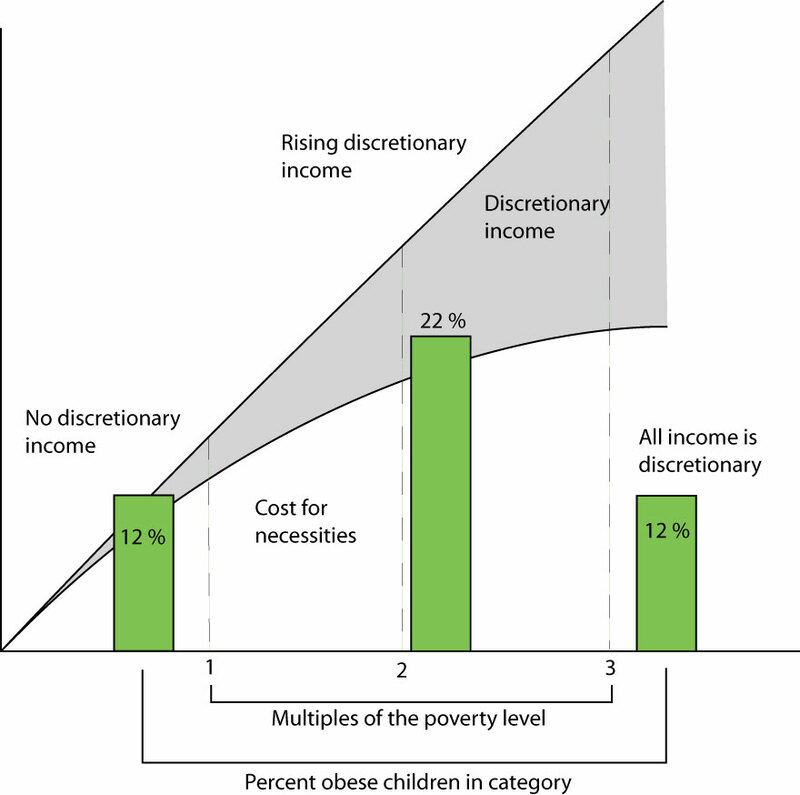 Thus, the appearance of discretionary income will have a profound effect on risk for malnutrition. It is a marker for the opportunity to be "plump and healthy." Low cost, high-energy foods are readily available and even desirable for families at-risk for food insecurity. Once sufficient income is obtained, concern for the cost of necessities recedes, and neither under nor over nutrition is likely. The opportunity to be "plump and healthy" can be rejected. A final consideration, deriving from the work of David Barker and colleagues in England  is that undernutrition in-utero and during the first months of life is a precursor of obesity and the elements of the metabolic syndrome later in life. Other data suggest that the obese mother with or without gestational diabetes mellitus is likely to have a child prone to metabolic syndrome. The impact of food security on transgenerational obesity is yet to be studied. The movement from wide-spread poverty ("developing") to affluence ("developed") is likely to be accompanied by a middle phase where incomes rise, but the population does not feel secure. Without systems of support, the likelihood of overnutrition and nutrient imbalance will increase. The model presented herein is applicable in developed countries other than the United States. As the indigenous populations of industrial democracies age and diminish in size, it is possible that resident aliens, those people needed to provide essential services, will not receive the same entitlement to health and nutritional benefits as the citizen. The model used in the United States, where the existence of substantial numbers of chronically poor people is an accepted norm, may spread to other developed economies. Two interacting sets of interventions are available to health professionals. These are, first, addressing the impact of income poverty on food selection and second, providing support for use of affordable, healthful foods. The model for providing these interventions is the "Medical Home." As described by Calvin Sia, pediatricians should see themselves as part of a team in which their unique part is providing well and sick care. The over-all milieu, however, should have elements necessary to provide access to care and resources, outreach to the community and elements of advocacy for unmet needs. Thus, the macro-social issues raised here are appropriate to pediatric care. A simple addition to a screening evaluation is to assess income expenses, resources for food and food insecurity. The first three questions of the USDA/Cornell Radimer food insecurity surveys are used in our work to determine which children are "at-risk." (Table 1). Is this child "at-risk" for food insecurity? These questions are adapted from the CDC and Cornell/Radimer Food Insecurity Questionnaires. They are highly sensitive and likely to capture all children affected by food insecurity or hunger. It is necessary in pediatric practice to identify the impact of convenience food use. A study in a poor community in north Philadelphia, compared families with malnourished children, to families with well nourished children. Each family was presented with three lists of foods: those requiring preparation by an adult called "basic," those not requiring home preparation but nutritious called "healthy," and those not requiring preparation but having a low nutrient to energy content called "non-nutritious." The essential difference between family groups was that families of malnourished children were dependent on convenience food. The cost for energy of the "healthy" foods was substantially higher than that for the non-nutritious. Other differences were found in knowledge and behavior of parents. 1) creating consortiums of community based organizations. 3) developing programs unique to targeted communities. 4) preparing material that promotes use of new foods. 6) evaluating the effectiveness of their intervention. All of these can be a part of a Medical Home that addresses the health needs of the community it serves. The interaction among genetic, social, cultural and economic element should not be considered separately. The data provided suggests that the appearance of discretionary income is an economic factor closely related to the prevalence of the various forms of under- and overnutrition. No cause and effect relationship is suggested. Rather the appearance of discretionary income, essentially the availability of that last dollar earned for discretionary spending, provides an indicator of the risk for undernutrition, overnutrition, and nutrient imbalance in communities of varying levels of wealth. Working to ensure the availability of food and other necessities as incomes rise to secure levels is one part of the process of preventing the undernutrition of chronic poverty from becoming the obesity of near poverty. Our goal is to move families to the high levels of nutritional status associated with affluence using a combination of income and food support, and community based nutrition education. Ensuring an income of opportunity – secure discretionary income – is an essential element in promoting community wide nutrition.